Large Mobiles for Open Ceiling Spaces. 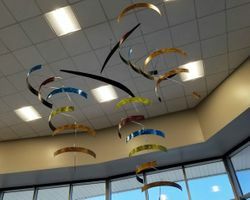 This section is devoted to the larger hanging mobiles such as the Tri-Lumen, Plateau and Shadow mobiles. 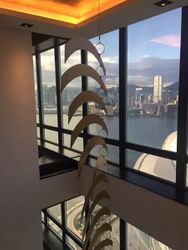 They are all designed for ceiling heights ranging from 9 1/2' minimum for a mobile like the "Tri-Lumen" to two-story livingroom spaces, entry ways, atrium spaces and lofted ceilings. 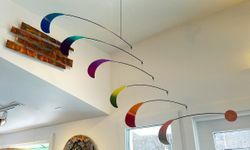 These larger mobiles are intended to be a center piece in a room. We offer customized colors within our fabric color ranges. This is a free service for anyone purchasing a Grand Tri-Lumen. A nominal fee is charged on the other large designs. Please remember, all of the mobiles in this category are for interiors only.